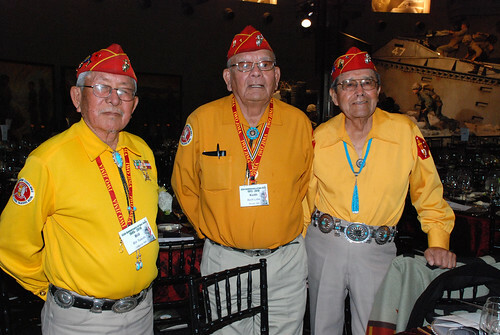 Three of the surviving Navajo Code Talkers attended the 65th Anniversary of the Battle of Iwo Jima. While all the veterans were treated like rock stars, these three men were like the rock stars of rock stars, almost mythical. They are a rare gem, becoming rarer as the years pass. Of the 400 Code Talkers, only 100 are still alive. These three men were on a mission this past weekend. That mission was to promote the building of the Navajo Code Talker Museum. If you follow this link, Navajo Code Talker Museum, you can get information on this project as well as see photos of the land where the museum will be built. Its a very beautiful setting. "Marines help each other out, " Keith Little told his fellow veterans at the symposium on Saturday. "Help us build our Museum. We won the war helping each other, we are asking for your help." The Navajo language was an unbreakable code. Amazing when you think about the complex mathematical logarithms were devised by Governments to encode information passed on the battlefield - - all broken. Yet, something that had existed for thousands of years, a native language used as a code - - never broken. Having this 'code' as an option is also amazing when you consider the US Governments history regarding Native Americans, their language and culture. The US Government had tried to "Americanize" the native peoples, sending their children to boarding schools where they were forbidden to talk in their languages, dress in traditional clothing or observe other traditions. The government tried to erase the native culture in the 19th and early 20th century. It failed. The Japanese tried to crack the code, recording the messages being passed and sending them back to Tokyo for analysis. The analysts couldn't crack it. Bill Toledo related an incident when he had traveled to Japan to speak. He met a Japanese soldier and introduced himself as one of the Code Talkers. He asked the man what he thought of them. The man got a very angry look and stormed away. Toledo, like several other veterans I spoke with, enlisted in the Marine Corps before completing High School. Marine Corps recruiters were looking for Navajo men who spoke both Navajo and English fluently as well as could read and write. They were not told why the Marines had those specific requirements and would not learn the reason until they were in training. They were to be the code. Their purpose, mission was classified until 196. For over 20 years, these men remained silent about their true contribution to the war effort. Once their role was declassified, they began traveling around the country telling their stories. For Toledo, the opportunity to leave the reservation and see other parts of the United States and the world was one of the benefits of being a Marine. He said meeting other people, experiencing other cultures really helped him grow as a person. After the Marines, Toledo returned home, finished school, got married and went to work. After a 30 year career, he retired and now travels, promoting the story of the Navajoy Code Talkers and their mission to build a museum dedicated to that story. The one thing he tells young people from his trive as they consider a life in the military is to not forget their language. "So many of our young people have lost the language, you know. I tell them to hold on to it." The thing he wants people to remember about the Code Talkers is that the code was never broken.